MacDonald Highlands is in Henderson, Nevada, a luxurious location that was recently named by Forbes as the second safest place to live in all of America! Henderson is only minutes away from the hustle and bustle of the city of Las Vegas, yet many families prefer the privacy and safety that a city like Henderson can offer. MacDonald Highlands itself is one of the most prestigious communities to live in all of Las Vegas. Get the full package of amenities, views and sense of safety at MacDonald Highlands. Approaching from a distance, you can see the first hillside homes-massive, glass-sheathed, clean-lined estates perched on the mountainsides. The unparalleled geography of MacDonald Highlands coupled with the community’s panoramic views of the Las Vegas Strip allows property owners unbridled creativity in designing their estate homes. Elevations are stepped; floor plans terraced, horizontal lines are emphasized and natural materials predominate. The private golf course known as DragonRidge Country Club is concealed behind MacDonald Highlands’ massive guarded gates and lushly landscaped entrance. This secluded course with its fairways, greens and tee boxes was sculpted and carved by famed designers Jay Moorish and David Druzisky who placed the golf course back into the canyons, among the rock outcroppings and arroyos, utilizing dramatic elevation changes throughout. Named after a rocky ridge, known to residents as the “Sleeping Dragon,” DragonRidge’s award-winning clubhouse features a gourmet steakhouse views of the Las Vegas Strip, two mixed grills and lounges, a ballroom seating 300 guests, a swimming pool and golf pro shop. The Tennis and Athletic Center highlighting a 14,000 square foot facility offers child care, an internet café and a staff of personal trainers and fitness instructors available to guide members through the latest in cardio and weight machines and to teach classes in Pilates, aerobics, cycling and kickboxing. The Center has locker rooms for members with sauna, Steam, Jacuzzi and massage. 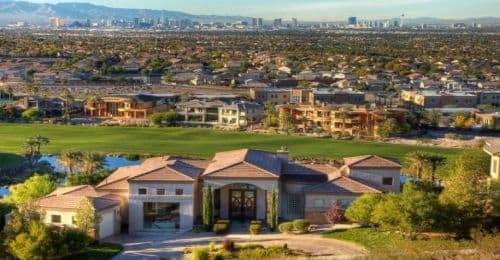 To begin a life of luxury and safety within the MacDonald Highlands private community in Henderson, contact us on our website to schedule a viewing. Call us at 702-614-9100 today.